Back in Waffle House again, but not out of necessity. This is where I started this piece, and this is where I will finish it! I’m still assimilating the past day and a half. Rocket launches are such a brief occurrence, so the majority of one’s memory from launch day are awaiting liftoff somewhere typically remote and uncomfortable, figuring out traffic afterwards, sorting through photographs, and talking with all your friends about what everyone saw and heard. It’s very easy to lose touch with those brief minutes when the rocket gods rain fire, bass, and thunder upon Space Coast. Our group met at a site off Center, and our friend with the NASA badge took us onto KSC. I had never been on Center in someone’s car! It was a wonderful experience to drive past the VAB, LCC, and press site with friends, park at the Turning Basin, step outside the car, and walk outside in this historic place for the very first time. From the KSC tour bus, the VAB appears small and inaccessible through the window. Being nearby it for longer, you realize just how big it is. Walking around, just about everything changes as usual - new sides of buildings, different light, a shift in perspective. The VAB still towers overhead in the same perspective even after you walk quite a ways. Arriving early at approximately 11:30, we made sure to set up our chairs and blanket right on the no-access fence, almost directly next to the crawlerway, as the photographers were already getting defensive about tripod territory. We were some of the fortunate few who had direct line-of-sight through the trees to see the whole pad structure. Falcon Heavy sat on LC-39A. The crawlerway cuts through the trees. Speaking of the crawler, it was in motion right next to us! Rumor has it they brought it out for a spin for the First Man shoot, the film about Neil Armstrong based on Jim Hanson’s book. From a distance, the crawler’s motion is seemingly undetectable - virtually no visibly moving parts other than the massive shoes on its tracks. The best way to see it moving was to look away for a minute. Its motion is very clear when tracked rather than watched. By the time the launch arrived, it was completely out of sight. A timelapse of the Crawler in motion. I’m glad I brought my binoculars, since they enable so much more to be seen. Three miles (4.8km) is close for launch viewing, but still a long way. Waiting for liftoff, other things like the VAB, Press Site, SLS gantry, and crawler could be observed much better. What other time would I be this close for this long? The SLS gantry was especially mind blowing. As previously described with the VAB, scale is an issue out there. The gantry didn’t look so tall, despite it being around 400ft (123m) high. Through binoculars, I could see construction workers, about the size of ants, working all around it. Without binoculars, they are not visible. VAB, LCC, Starliner Facility, Shuttle MLP, and SLS Tower seen from the Turning Basin. Honestly just happy to be in KSC at all. The Press Site and Turning Basin itself. So that is where we were - even closer than the press site where the news sets up by about 1,200ft (366m), as I just calculated with friends at Zarrella’s today. We were among the closest 100 people or so, just 3 miles (4.8km) away. Anyway, I’ll move on the titular topic. Even before the launch window opened at 01:30, delays started to push us back and keep us in the blazing sun for longer. By this point, a large crowd of NASA employees and their guests had assembled, and the water ice truck was not satisfying. A couple food trucks arrived to keep everyone awake. People were sleeping everywhere, their cameras already set up and standing by. The kids were tossing footballs and frisbees around. Some very eager photographers and other employees were violating the restricted areas and got intercepted by security. After those incursions, a military vehicle with armed soldiers arrived on the scene. An air force Blackhawk with weaponry and soldiers had been circling around the launchpad for hours watching out for incursions. In the distant skies, NASA and air force jets circled the perimeter, ready to act in case of range violation. Those upper level winds causing unfavorable conditions weren’t dying down, and many of us were expecting a scrub and having to come back the next day. Though our friend had access to the SpaceX phone number, we were speculating on our own about the restrictions for T-0. They typically need about an hour to load the propellents, and the window was to expire at 04:30. The clock was on hold at T-2 hours. That meant if they didn’t find a gap in the upper level winds by 02:30, a scrub was likely. Just around that time, after many 5-15 minute pushbacks, a final T-0 of 03:45 was set, with 90% favorable weather reported. We went from expecting a scrub to expecting a launch! The weather was cooperating - except for the sun beating down on us in the grassy field, with no shade except a hired party tent. You can tell who waited for the launch and who didn’t just by looking at the state of their tan. Or in my case, sunburn. If I were a lobster they’d say I’m done. In all, we spent over 4 hours waiting. Could have been worse, though. How about that view! We also discussed what to do in case of an anomaly (NASA-language for explosion). If the vehicle exploded on or near the pad, we would be in a bad spot. Our NASA friend told us the worst thing you can do is get in the car. If it were hit by debris, it would essentially be a bomb. Either run for the LCC, jump in the ditch that was nearby, or curl up in a ball and hope. In any case, though, the odds of being hit are minuscule and no one was really worried. Waiting all those hours is not a chore from my position. 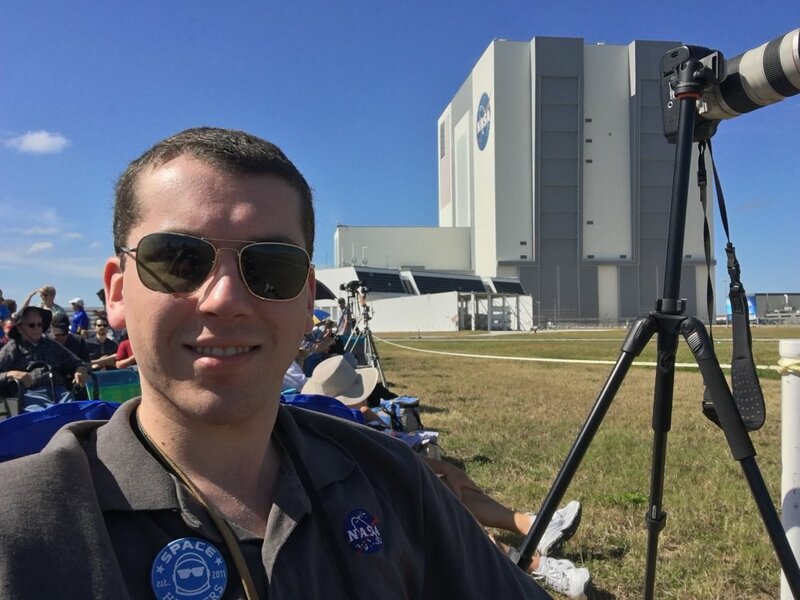 It was my first time at an official NASA site for launch, and outside around the VAB-area. Just looking at the KSC scenery and Falcon Heavy out there on the pad was all I needed for entertainment. Looking up at the VIP balcony at OSB-2 though binoculars, I believe (with lots of doubt) that I saw Elon Musk and his entourage. Whoever it was, he sure had a front row spot with a lot of people around him. At 03:30, as the rocket began to vent LH2 and LOX propellent to keep the tanks topped off, people became antsy. Some were pacing. If something goes wrong that late in the launch window, it means a scrub is certain. The venting LH2 was dramatically windblown through the scaffold-like gantry; and through the air, the vehicle felt alive and dangerous, as if it had steam coming out its ears. Liftoff snuck up on me. We had been in this same spot for hours, and even at T-30 seconds, part of me didn’t get a grip that it was actually going to happen! On a lesser level, I can echo what some astronauts say about lying on your back in the spacecraft, still in some disbelief until those engines ignite and you’re leaving. As the crowd counted down to zero, a massive plume of water vapor from the deluge system blew out through the north flame trench. The voluminous white cloud curled back on top of itself like a rolling blanket. There was a brief and powerful flash, an orange glow, and as another vapor cloud blew out the south trench, Falcon Heavy woke up and slowly - very slowly - began to hover above the launchpad, asking which way to go. Having now seen the replays, I remember the vehicle moving much slower. Time was standing still for me from adrenaline. Just 3 miles (4.8km) away, the vehicle appeared BIG. The explosion blowing out of the engines was nearly as bright as the sun, giving my eyes afterimage spots. Five Million lbf (22.8 MN) of sound, at a low thrust/weight ratio, hit us in our chests at the Turning Basin. The ground was actually rumbling, albeit dully. Unlike the Space Shuttle, with its loud and crackling Solid Rocket Boosters, this entirely liquid-fuelled rocket produces deep-bass similar to what you might feel at nightclub. This sound source, however, was miles away. Ignition and liftoff, with expressions of support from the crowd. 3 miles (4.8km) away! As the vehicle rolled, the enormity of what was happening finally hit me. That roll was truly something to behold! This tall, wide, flat rocket, rolling over onto its back, pitching out over the ocean, moving faster and faster, still growing louder because of sound delay, was truly surreal in flight. People around me went back and forth from stunned silence to cheering and yelling. I put down my camera and enjoyed the experience until the vehicle began producing a contrail in the upper atmosphere. I was a trifle worried about viewing through binoculars for fear of eye damage, but figured this was worth it. Falcon Heavy climbed steadily higher and farther away from us, heading directly out over the Atlantic. After a couple minutes, the bass gradually turned down in volume like a song fading to silence, and everyone started running to the other side of the field to watch the boosters return. I stayed put at our spot to observe the conditions at the pad after launch, figuring I would experience as much of the landings from here as they would, just a football-field farther away. A contrail formed in the upper atmosphere, as the vehicle's exhaust plume grew larger and larger in the thinner air. Post-launch, you’re still in shock for a bit. Adrenaline is still flowing, and thoughts are racing about photographs, where you should be standing, and what you should be experiencing. My first reflective thought was being surprised it wasn’t louder. We were expecting a Shuttle-level sound experience; but the weather, wind direction, or simply the lack of SRBs made it quieter and bassier in nature. It was still loud since we were so close, but others I know at the Causeway, SR-401, and Merritt Island say it was like a Falcon 9 launch. Someone I know who was at Playalinda says it was extremely loud. Wind direction was towards the NNW, so these accounts all agree. At the Turning Basin, we were directly crosswind, so we heard the middle-ground volume. Meanwhile out at the Pad, the water-deluge vapor clouds had risen up and merged. It was beginning to look just like a regular cloud. After the wind picked the vapor up and started moving it to the NNW, it was indistinguishable from the other small clouds. I watched it go towards the horizon, realizing that people up in Daytona Beach and possibly beyond may see a humanmade cloud that afternoon. Finally, it was time for the boosters to come back. At 10 miles (16km) away from the Landing Zones, I wasn’t expecting much of a show. I also wasn’t expecting the boosters to land simultaneously (some said there would be a 15 second gap in the landings). Yet, SpaceX delivered! The boosters came back very close together, seen as little white flames in the sky. They eventually lined up and landed just seconds apart. Through binoculars, I could see the charring near the engines and the gear deploying. Just after the boosters slowed and went behind the trees, six muffled sonic booms startled us, three from each booster. The muffled sonic booms of the two boosters, from 10 miles (16km) away. As far as KSC was concerned, the launch was over. There was cheering and jubilation all around as the crowd returned to pick up their gear. We were all sharing our amazement and exultation in what we were present for, as well as what was different from our expectations. I got sad as I started to realize we had to leave this wonderful site. Another reason to be sad: post-launch traffic. We sat it out as long as we could, but eventually it was time to go. Leaving KSC wasn’t so bad for us, especially since we were basking over the live feed of Starman over Australia before the following TMI burns. However, heading to Zarrella’s for our celebration, the traffic was murder in all directions. Almost an hour just to cross the bridge, and that was eastbound! The beachline was clogged all the way to Orlando. Post-launch traffic on the Beachline, reminiscent of Shuttle days. Finally, Zarrella’s! The Space Hipsters HQ was packed, as it usually is after a big day like this. All night we talked about the experience, space rumors and politics, the future of the space industry, Elon Musk, and other ideas related, as another group of us did today at lunch. My inner child is stunned at what has happened. I got to have this wonderful experience, and I got to ‘be there’, on site for a major launch. I hope that someday, I can do it with my own badge, and treat a car load of space geeks to the same experience. Special thanks to my NASA friend for inviting me to witness a monumental spaceflight. Images Courtesy of the Author, except where noted otherwise.